If you’re an avid fisher, this is a question that would keep asking around. While there’s no right or wrong answer to this question, there are some factors that you need to consider when deciding to take your kayak, rod and tackle out. Fishing for a successful trip at the right time is crucial. You might own the best fishing gear and choose the most favorable spot, but that doesn’t mean you will end up catching fishes if you go at the wrong time. Hence, here is some useful information on the best time to go fishing. Know when you can catch more fish and learn about the time of the day, tide and so on. Fishes are coldblooded creatures. Their activities totally depend on water temperature. They remain inactive when the water is cold and retreat into deeper water when it’s very hot to stay cool. Fishes are the most active when the bugs are active. That’s because they survive by eating insects and little fishes. 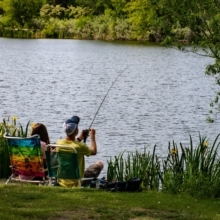 When the air becomes warm and thick with mosquitoes, fishing is an ideal time. Spring: Spring is one of the four conventional temperate seasons that just start after winter and follows to summer. So, there’s actually not much you can catch in springs until the water gets warmer. Bugs are also not out much, so you need to take advantage of their feeding time during dusk. Summer: This is undoubtedly the best season to go fishing, but you must make sure to avoid the hottest days of the season. Fishes bite well just before sunrise and right after sunset when food is abundant. At noon-time, when the sun is at peak, fishes are likely to retreat to more cooling, deeper water. Fall: This time of the year is very inconsistent because if fishing turns out good, it’s going to be very good. Fishes don’t bite much early in the morning or afternoon. You will only be able to see them towards the end of the day when the water becomes a little warm after hours of sunlight. Dusk is obviously an excellent time for fishing during fall. Winter: Winter is seriously not the best time for fishing. And the reason behind this is quite apparent. Not to forget that unless you go ice fishing, you should store your fishing rod and other gear during the winter. Rain can be both your foe or your friend; depending on how hard it could be. Light rain is actually good for fishing, especially during summer. The water surface gets blurred, which makes it difficult for the fishes to see you. Plus, it also washes the insects into the water, making it a good time for fishes to eat. On the other hand, if it rains cats and dogs, it would stir up mud and make it harder for fishes to breathe, hunt and navigate. The fishes won’t come out of the water in such weather, and it’s also not safe for you to fish under such conditions. Cloudy days make fishes bolder. They swim further from safe structures when it’s a little darker outside. These are actually good fishing days that you could target for. Did you know that the moon controls the tide? It’s somewhat easier to keep track of the waves by observing the movement of the moon. Times when the moon is rather closer to the earth and full moons are an excellent time for fishing. It’s a good time for fishing when the tide is either rising or falling. That’s because this change causes the prey to move en-masse, which makes it an excellent time for coastal fish to feed. Fishing is difficult during high or low tide when there’s less water movement. If you are looking to find the times of high and low tides in your area, just Google “tide chart” along with the name of your town. In tune, if you’re fishing during high tide, look for shallow areas. While during low tides, look for mud banks near a slough. Of course, it’s better when you know that fishes are out there biting and just when you’re out, you’ll be able to catch them. However, the truth is that it’s always better to go fishing when you know that you have ample time. You can enjoy an afternoon with some drinks and your friends without even catching a thing. Fishing is a fun activity. Don’t get so hyped up in finding the best time to catch your prey that you forget to enjoy your time. Other than that, whenever you think you can wet a line, it’s already a good time for fishing. All that matters are when it’s a good time for a bass bite. The moon forecast is a great indicator that works wonderfully. It has been tested to be successful as being the best time for fishing. So, the best lesson in determining the best time for fishing and the best tide for fishing is to avoid any extreme temperatures. Fishes are hard to find when it’s hot and harder to see when it’s cold. Understanding these bits and pieces of biology will help you decide the kind of lures and baits that you should use, and how fast or slow to work them. One general tip: work your tackle slower in colder water and faster in warmer water. We hope that you found this article helpful. Are there any other fishing tips that you’d like to share? Let us know in the comments section below!